There’s a dumb way of thinking that judges each new bar or brewery in London to be somehow parasitic in its attitude towards the scene, trying to take a slice of the action for purely financial gain. Whilst that is no doubt the case in a handful of (usually rather obvious) cases, it’s a false and harmful view. Every part of London’s beer scene, especially those parts that make a go of it out in unclaimed territory, usually contribute something good. If they don’t, they soon fall by the wayside. Those that do contribute become the hub of a protozoic scene of their own. 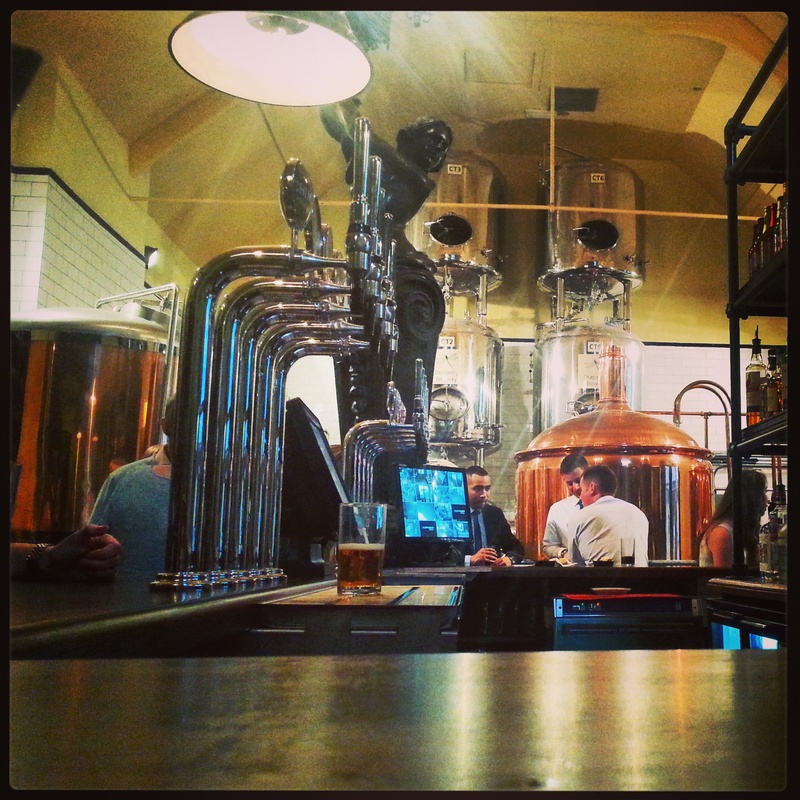 Last month I visited The Gun in the docklands and the Dragonfly brewpub in Acton, and it struck me that each of these pubs seem to be pioneering a mature and exciting beer scene in their respective areas single-handedly. The Dragonfly Brewery at the George and Dragon pub in Acton officially launched on May 15th, and I was invited to taste some of the beers brewed by Conor Donaghue (formerly of the Botanist at Kew and the Lamb brewpub). The pub itself is a lovely place, it’s front wholly given over to the building that has been a pub since at least 1759, whilst the bar in the back room, a music hall once upon a time, is a gleaming chrome and brass affair on polished dark wood that evokes something more Continental, or American, or perhaps both, rather fittingly considering the beers being brewed. In a four-strong starting lineup (the strikingly authentic 2 O’Clock Ordinary best bitter; zesty, crisp and punchy Early Doors US-style pale; a sweet and subtly spicy Achtung Hefeweizen; and the nougaty-sweet and sharply coffee-tinged Dark Matter Stout), Connor has established a strong core range of technically accomplished and drink-by-the-pint beers that hint of great things to come. More impressively, the 2 O’Clock Ordinary best bitter on sale was the first beer Conor had brewed on Dragonfly’s brand new and oh-so-Instagrammable brewkit, installed behind the wonderfully-appointed island bar. You can read more about the beers and the brewery from the more detailed accounts of the launch night by Justin Mason, Matt Curtis and Steve from the Beer O’Clock Show. Aside from the great beers and the wonderful food (which include diet-busting beer accompaniments like deep-fried, breadcrumbed parcels of macaroni cheese and Dark Matter stout-battered black pudding fritters), the pub and brewery had something special about it. There was a certain shape, light and form to the place that seems destined to be a local focal point for good beer. 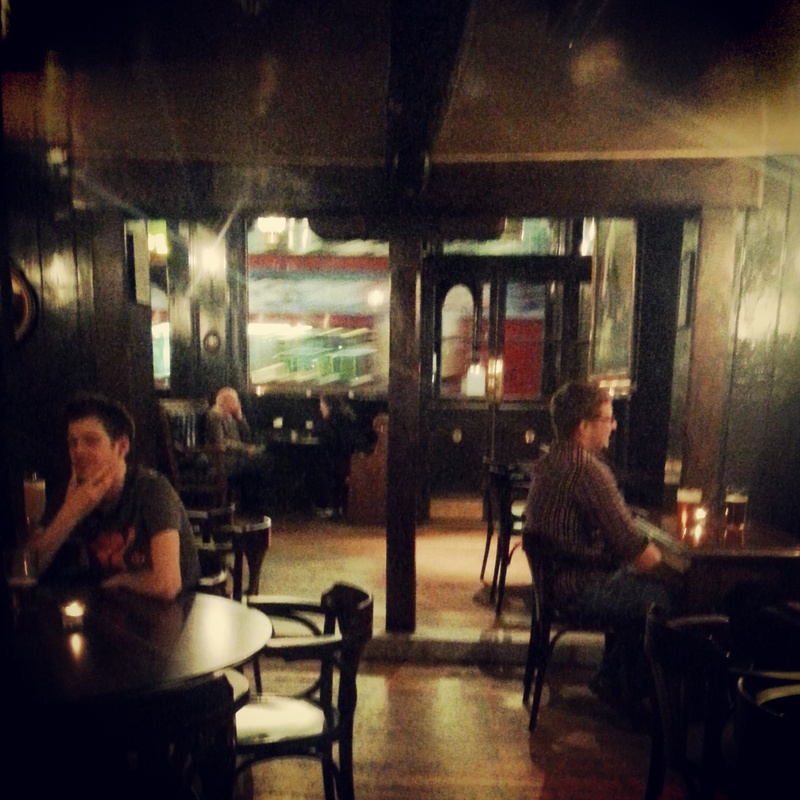 The cosy front section of the pub, so reminiscent of the wonky-ceilinged and creaky-floored pubs of York, is a warm and welcoming place, whilst the airy, light and clean space of the brewery/bar area has the vibrant, lively atmosphere of somewhere like Camden Town Brewery. There’s no question that this place will be Acton’s flagship craft beer pub in no time. Meanwhile, on the other side of the city, The Gun pub recently hosted its Spring Haze unfined beer festival. The Gun is a pub I’ve written about before, and between the excellent beer selection, high-end food and beautiful interior, there’s plenty to like about it (and, if that wasn’t enough, the people behind The Gun have something planned for Ealing which should be every bit as good, if not better). So why a festival purely for ‘unfined’ beer? The issue of unfined and intentionally hazy beer has gained a bit of traction both in the blogosphere, and even on the websites of the national press, recently. The Gun’s manager and top beer bloke Barny sees the festival as a way of introducing the idea of unfined beer to a population that is either a) conditioned to be mistrustful of it and/or b) might not know anything about it. As more and more people enter the world of good beer through the offerings of the smaller, newer London brewers, more people will be trying ‘unfined’ beer and seeing it as normal. As far as they are concerned, if it tastes good, what’s the problem? For the more old-fashioned, the festival serves as an argument for the technical skill of the brewers represented on the bar. Once upon a time, the idea of a hazy beer festival might have been the subject of a cartoon in a local CAMRA magazine. Whilst the breadth of beers available at Spring Haze, including offerings from ‘unfined’ stalwarts Moor as well as Beavertown, Pressure Drop, Windswept, Weird Beard, Brew By Numbers, Arbor and Gyle 59, demonstrates a slant towards newer brewers certainly, the beers themselves were hugely diverse. Moor’s black IPA, Illusion; the coconut edition of Weird Beard’s Fade to Black, Windswept’s Weizen and Gyle 59’s Toujours saison show that these aren’t just the much-derided London Murky pale ales of many a railway arch – these are technically impressive, innovative and well-brewed beers. 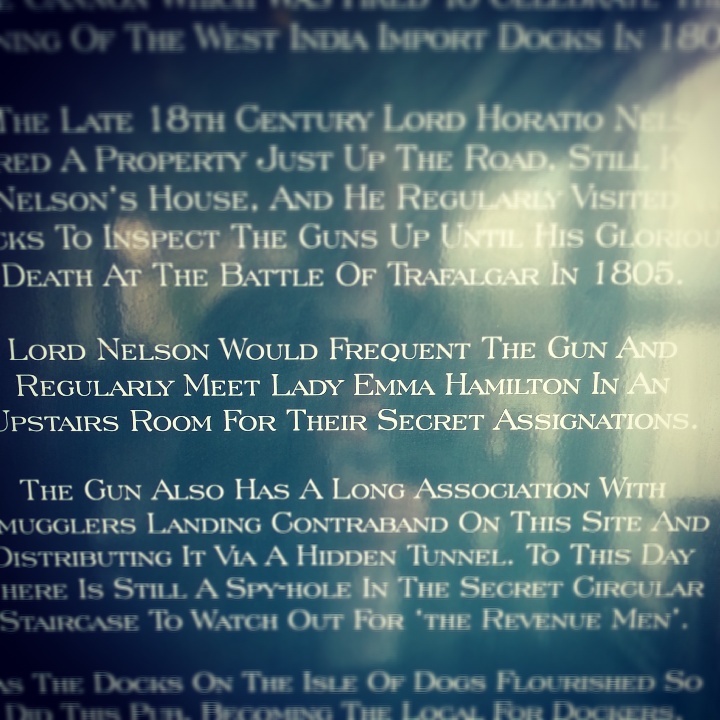 It helps too that the Gun is such a great pub, with a great history (see below). 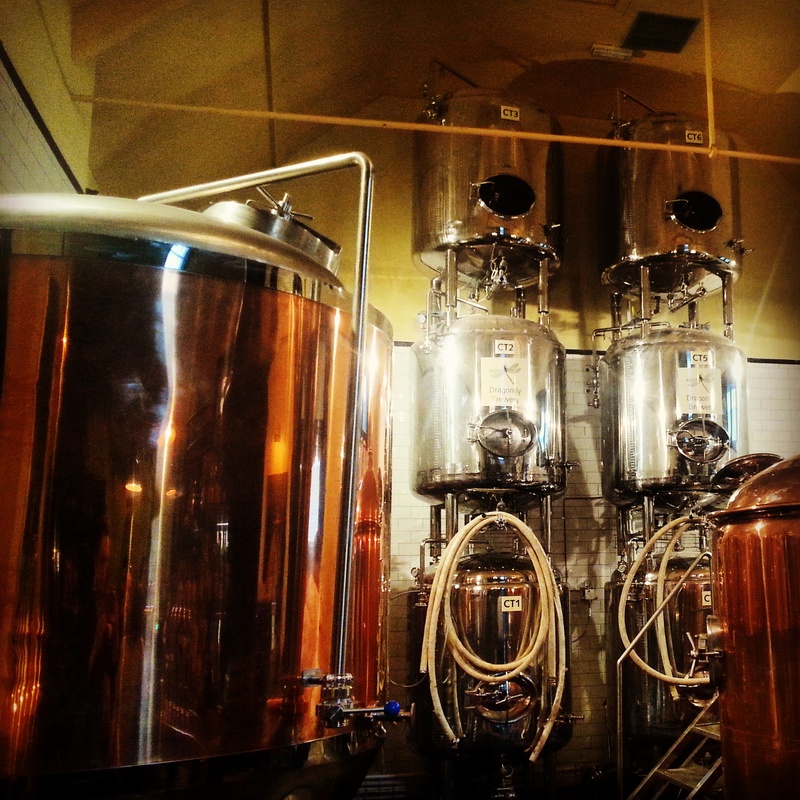 Opening a shiny, multi-faceted gastro-brewpub like Dragonfly or running an unfined beer festival might seem like the type of thing to go down in Dalston or North London, but these things are happening in what, for London craft beer, is the wild frontier. There’s not even a whiff of cynical cashing-in or bandwagon-riding. These are simply great pubs, providing the kind of experience that wins people over to a scene that can seem to be just that: a scene. So whether it’s by the wings of a Dragonfly or the hot iron of a Gun’s cannonball, there’s many a trail being blazed. When the newcomers are this good, it shows that London’s craft beer boom has far from peaked, and that if anything, those in the first wave might need to up their game.